Here’s some good news for victims who are trying to unlock and remove TeslaCrypt ransomware. 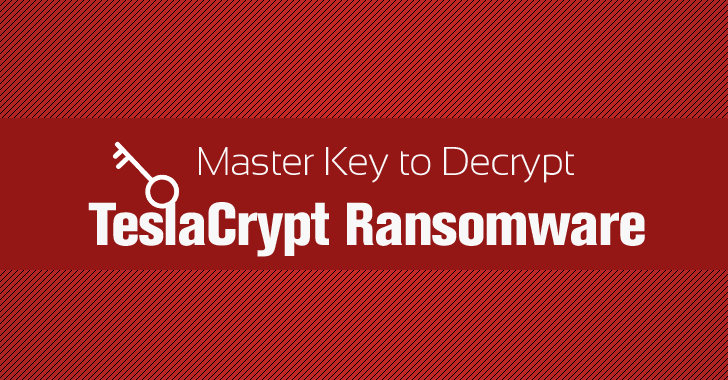 Now, you can decrypt all your important files that have been encrypted by TeslaCrypt ransomware. So, stop Googling about How to decrypt TeslaCrypt Ransomware encrypted files, as the malware authors themselves provided the solution to your problem. Since its launch in March last year, TeslaCrypt computer virus has been used in massive malvertising attacks. The ransomware, which often targets PC gamers, locks up files until a ransom is paid, usually $500 in Bitcoin. Infection generally comes through corrupted websites, malvertising or phishing emails. In a surprising move in the malware's story, the cybercriminals behind the nefarious TeslaCrypt ransomware have apparently shut down their operations and released a master key to the public that can unlock all encrypted files on PCs infected by the latest versions of TeslaCrypt. The icing on the cake is that the universal decryption key is free, so victims can decrypt their files without paying a single penny. "Project closed! Master key for decrypt: 440A241DD80FCC5664E861989DB716E08CE627D8D40C7EA360AE855C727A49EE. Wait for other people make universal decrypt software. We are sorry!" The above note was prompted by a query from an ESET security researcher, who had noticed the successive downfall of TeslaCrypt and asked the authors for a decryption key. The authors offered a free master key in an entirely surprising move and ESET quickly created a Free Ransomware Decryptor tool for TeslaCrypt, which is available for download from the ESET website. Using the master key, security researcher has created a decryptor tool that is available for download, with detailed instructions, from the ESET website. 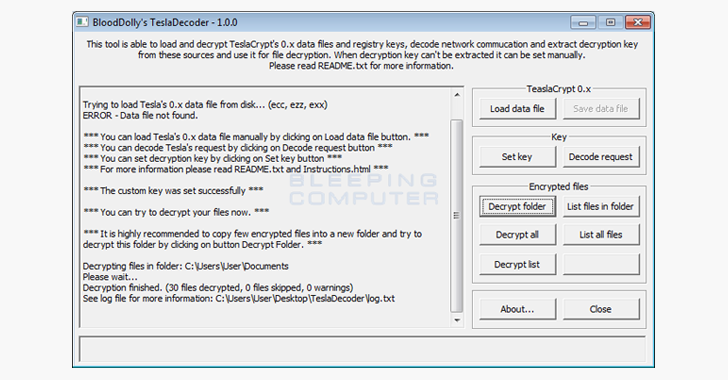 Bleeping Computer has also released another TeslaCrypt ransomware decryptor tool, dubbed TeslaDecoder, with a much easy-to-use interface.